Symbolic image of light interacting with a gold surface with 4-fold symmetric Archimedean spirals: Plasmons with orbital angular momentum are excited and swirl towards the center. A team of Israeli and German researchers from Technion in Haifa and the universities of Kaiserslautern, Duisburg-Essen and Stuttgart have been able to reveal for the first time the dynamics of the orbital angular momentum of plasmons. The researchers used a combination of extremely high-quality single crystals of gold, ultrafast laser pulses and an electron microscope. When an electron orbits around the nucleus in an atom, simple models describe its motion with spin and angular momentum. Spin means, in a classical picture, that the electron spins around much like a little sphere, and angular momentum describes the motion of the electron around the nucleus. This model is very similar to the earth orbiting the sun, spinning around an axis that extends from the North to the South Pole (which takes a day), while simultaneously travelling around the sun (which takes a year). Light can have similar properties: Its “spin”, which should rather be called “helicity”, tells us whether a photon has right-handed or left-handed circular polarization. But what corresponds to the angular momentum? This is the so-called orbital angular momentum, which describes a wavefront that spirals around like a helix, just like a staircase in a tower. This orbital angular momentum has recently gained a lot of attention, as researchers hope to encode information into it and thus either enhance the capacity of fiber optical communication systems, or use it for quantum information protocols, which might be useful for secure communication. However, the size of these beams cannot be smaller than one wavelength of light, or about half a micrometer in the visible spectrum, which limits the possibility to integrate such beams into tiny devices in the future. Here is where plasmonics enters the picture. 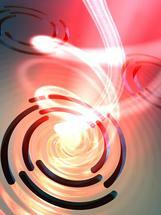 Plasmons are collective electron oscillations in metals that can be excited by light. If a stream of photons impinges, for example, onto a gold surface, the electric field of the light field makes the negatively charged electrons oscillate back and forth, just like water in a bottle when it is shaken. The advantage of these plasmonic oscillations is that they are bound to the surface of the gold or to the interface between gold and its substrate, and that they can have a much smaller wavelength than the original light. Therefore, they are ideally suited for integrated devices with sizes below 100 nm (one-tenth of a micrometer). The Israeli/German research team cut Archimedean spirals into the gold, which allowed the light to excite plasmons that had orbital angular momentum. Grisha Spektor from Technion in Haifa, the first author of the paper, came up with the idea to vary the geometry of the spirals, hence creating angular orbital momentum that ranged from 1 all the way to 10. Bettina Frank from Harald Giessen’s group in Stuttgart was able to produce extremely high-quality gold samples that had single crystal properties and were atomically flat. They cut the spirals into those crystals. Martin Aeschlimann and Deirdre Kilbane in Kaiserslautern and Philip Kahl and Frank Meyer zu Heringdorf in Duisburg then used ultrafast lasers to shine light pulses as short as 13 femtoseconds (10-15 seconds) onto the crystals, which created plasmon waves. They observed with an electron microscope how the plasmons ejected electrons at the top of the metal and could in such manner image the plasmonic waves. By sending two ultrashort laser pulses with a delay onto the sample and then varying the delay, it was possible to record complete movies of the plasmon waves. In this case, the first pulse created the plasmon and the second pulse interacted with the plasmon and liberated electrons on the surface, which were then imaged. 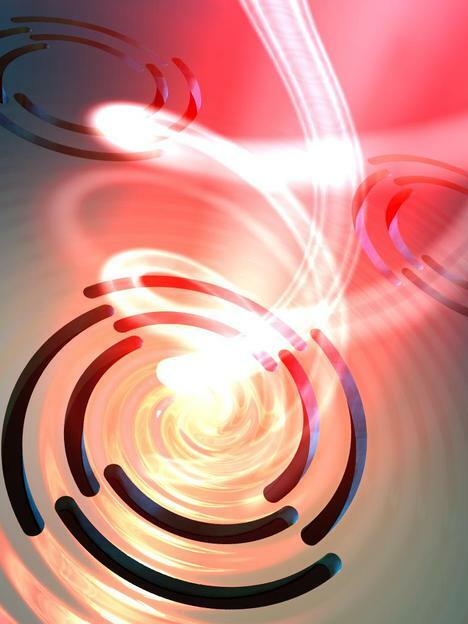 The researchers were stunned to observe the formation of plasmonic vortices by inward spiraling plasmon waves, and to see how those vortices spun around on a time scale that was comparable with the time that light needs to complete an oscillation, a so-called optical cycle. The larger the orbital angular momentum, the longer the vortex takes to spin around. Interestingly, the observation of the vortex dynamics can also be used to distinguish the helicity of the light, meaning that one can separate left- from right-handed circular polarization. The authors believe that their work can open the door to ultra-compact integrated devices that utilize orbital angular momentum of plasmons to encode information. Furthermore, novel light-matter-interaction effects on a deep subwavelength scale could be studied when such plasmons interact with matter that is sensitive to higher orbital light momenta, for example in non-dipolar transitions.